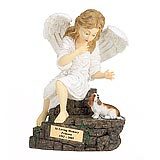 "We received the Angel Ashes the day before yesterday. As you know losing a pet is very traumatic. It took a lot of research to decide what to do with my beloved dog's ashes. I am extremely grateful that you had the foresight to create Angel Ashes. You have been extremely gracious, extremely helpful and professional to work with. In this very difficult time for us you have helped our family deal with this loss in a dignified and loving manner. My veterinarian who has know me before the birth of Silky was as stricken as I. I am recommending that they keep your information on file so that other owners can find the peace that I and my family have found." 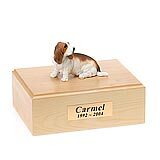 All available Basset Hound dog urns and memorials will be displayed with the figurine on the Basset Hound urn you select and in the appropriate size.